U.S. Army Tries to Recruit Gen Z to Military With New Strategies, Like E-Sports The U.S. Army is looking for recruits in new places like Instagram and e-sports tournaments. NPR's Leila Fadel asked Gen. Frank Muth, head of the Army Recruiting Command, about the new strategies. New Army recruits take part in a swearing-in ceremony on June 4, 2017, in San Diego. "Calling the Z generation on the phone doesn't work anymore," Muth said in an interview with NPR's Leila Fadel. "We're really giving the power back to our recruiters to go on Twitter, to go on Twitch, to go on Instagram, and use that as a venue to start a dialogue with the Z generation." In this dialogue, Muth hopes to clear up some misperceptions among Generation Z about the Army. He said these range from anything like the belief that you're not allowed to own a dog or car while serving, to larger, more serious ones, such as fears that the Army is an unfriendly environment for minorities or women. Muth said the Army is trying to achieve a higher representation of both women and minorities within their ranks. A U.S. Army recruit practices building clearing tactics at Ft. Benning, Ga. on Oct. 4, 2017. Another misconception Muth said exists is that serving in the Army is dangerous. He said only a small percentage of those in the Army directly participate in active land combat. The rest work in a variety of around 150 different jobs. "It's not just about being in the infantry or the armory or combat roles. Across the board we've got combat photography, we've got medical, engineering, cyber, IT," Muth said. "There's a lot of different ways to serve. " The variety of potential jobs offered is one of the selling points that the Army is using to attract young people. Another enticement, Muth said, is the promise of free college. "That is huge selling point," he said. "I just paid for 2 years 2 months of college for my son and two years, two months for my daughter utilizing my GI bill. We saved $90,000 by doing that." Another enticement the Army uses to bait young people is signing bonuses, which can go as high as $40,000, depending on one's military operational specialty. The average signing bonus, Muth said, is $12,000. Out of all the online platforms for recruitment, Muth said Instagram is "it" right now, but he is excited about the potential in e-sports. "It is incredible, the amount of coverage that you get and the amount of the Z Gens that are watching these games," he said. For example, he said that one Army recruiter went on the air as an e-sports announcer in a tournament, and within 24 hours, they had 2 million views. Of those views, half were from people aged 17 to 24. To further recruitment efforts in the e-Sports community, active duty military try out for the Army e-sports team, and if they qualify, they are moved to Fort Knox to be on the team. At Fort Knox, they also get trained on becoming a recruiter before they enter into an e-sports tournament. 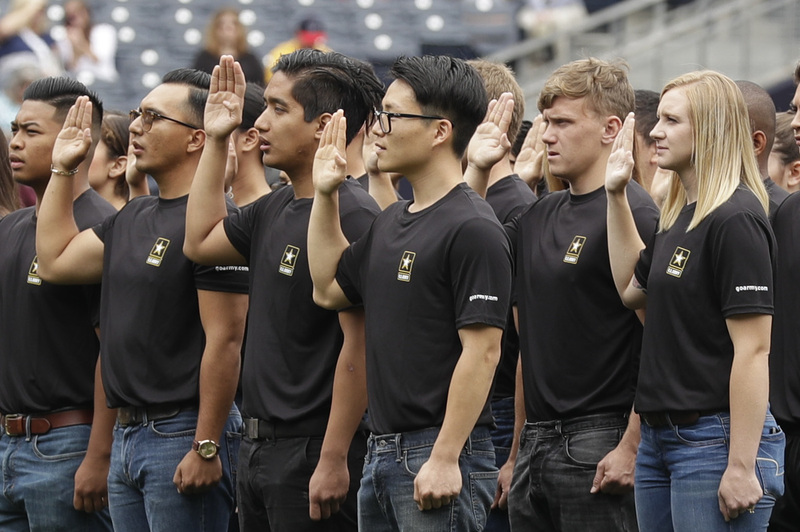 For the upcoming year, Muth is unsure what the Army's goal for recruitment numbers will be, but thinks it will be lower than the goal of 76,500 people they had last year. In general, he remains optimistic about recruiting Gen Z'ers. "Here's what we're finding different as we've shifted from the millennials to the Z Generation. Z Generation, they do want to be part of something bigger," he said. "They do want to give back. They do want to serve and they want to get out there and be part of something other than just being about themselves." This story was produced and edited for radio by Sophia Boyd, James Doubek and Caitlyn Kim.